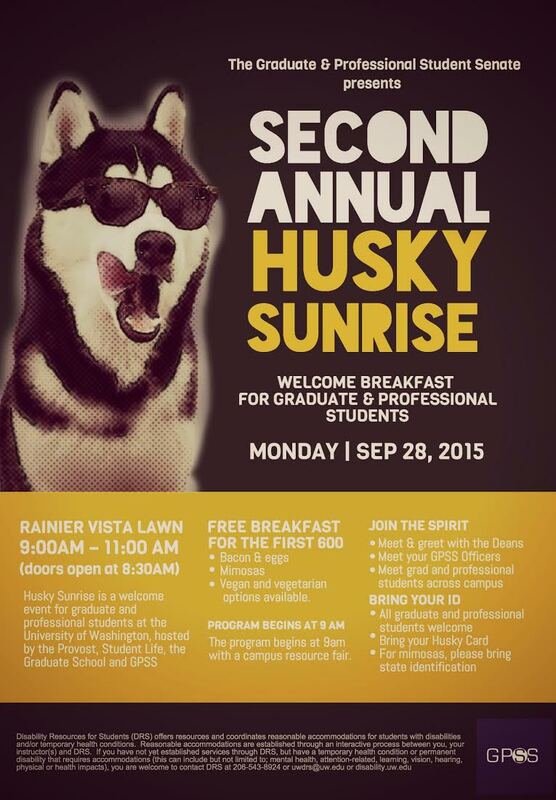 Husky Sunrise is the 2nd annual welcome event for graduate and professional students at the University of Washington, hosted by the Provost, the Graduate School and the Graduate and Professional Student Senate (GPSS). Take advantage of this unique opportunity to mingle with UW administrators, faculty, and graduate/professional students from across all academic disciplines. *When? *The program begins on September 28th at 9 am (Breakfast starts at 8:30). *Who’s invited? * All incoming and current graduate and professional students are invited to attend. *What’s for breakfast? * A hot breakfast including bacon, eggs, and mimosas is guaranteed for the first 600 guests. Vegan and vegetarian options will be available, too. *What should I bring? *All guests must bring their Husky Card and those wishing to have mimosas will need to provide additional identification proving that they are 21 or older. Guests requiring accommodations, please e-mail gpss@uw.edu so that arrangements can be made.